UC Santa Cruz astronomer Ian Crossfield and Caltech staff scientist Jessie Christiansen launched the Exoplanet Explorers project on the online platform Zooniverse in 2017. The project gives volunteers the ability to sift through data from NASA’s Kepler space telescope for signs of exoplanets. “People anywhere can log on and learn what real signals from exoplanets look like, and then look through actual data collected from the Kepler telescope to vote on whether or not to classify a given signal as a transit, or just noise,” said Christiansen in a Caltech news release. “We have each potential transit signal looked at by a minimum of 10 people, and each needs a minimum of 90 percent of ‘yes’ votes to be considered for further characterization,” she added. In April 2017, the Exoplanet Explorers project was featured on the Australia Broadcasting Corporation (ABC) program Stargazing Live. On the final night of the three-day event, citizen scientists uncovered K2-138. Originally thought to be a four-planet system, it has since been upgraded to a five-planet system. 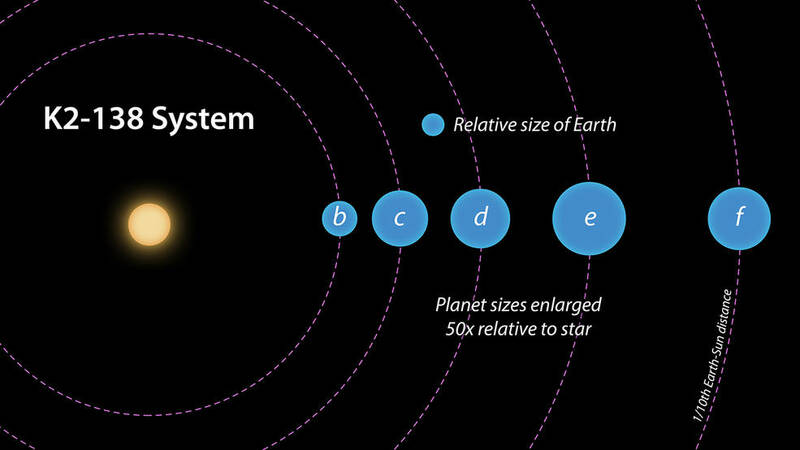 Eventually, more planets could be discovered orbiting the system’s star. A further interesting subset of these systems are those demonstrating resonances, or chains of resonances. The five validated planets of K2-138 lie close to a first-order resonant chain. We find period ratios of 1.513, 1.518, 1.528, and 1.544 for the b–c, c–d, d–e, and e–f pairs, respectively, just outside the 3:2 resonance. Fabrycky et al. (2014), examining the large population of multi-transiting planet systems in the Kepler data, showed that pair-wise period ratios pile-up just outside of the first- and second-order resonances. What they will find is that the conjunction ratios are also near 3:2, but even nearer than the orbit ratios are. This is generally the case (i.e. conjunctions better than orbits for resonance), e.g. for Jupiter’s four Galilean moons, and Trappist-1 exoplanets. Note: conjunction means two planets in line with their star. Planets d,e and f orbit in 5.40, 8.26, and 12.76 days respectively. Using the best of the orbit ratios (1.513) the match is 99.14%, reducing to 97.15% for the worst. That confirms the conjunctions ‘fit’ much better than the orbits, as expected.